Chad Laprise was the first fighter to step on the scale during the morning weigh-in session and he did so with a dejected look on his face. The former TUF: Nations winner entered his bout with Thibault Gouti on a two-fight losing streak – the first two losses of his career – and was hell-bent on righting the ship that weekend in Vancouver, British Columbia. Clocking in three pounds over the lightweight limit, Laprise shook his head as he put his sweats back on and headed out of the room, the staunch professional frustrated with his inability to make weight. The next evening, Laprise went out and found his way back into the win column, storming through Gouti in just over 90 seconds to halt his two-fight skid and register his first stoppage victory in more than four years. 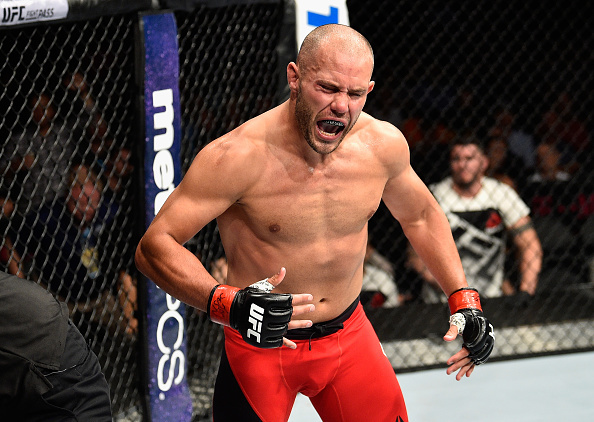 That victory came with Laprise competing at welterweight, and on the mic that evening in Vancouver, “The Disciple” apologized for his miscue and declared he was heading back to the 170-pound weight class and he hasn’t looked back since. In addition to moving back up a division, the 31-year-old also moved back home. Following his time on TUF: Nations, where he defeated teammate Olivier Aubin-Mercier in the finals, Laprise relocated to Montreal to train alongside Aubin-Mercier and countless other standout talents at the city’s famed Tristar Gym. Although working with Firas Zahabi and company proved fruitful, the Southern Ontario native longed for a return to his roots, so he made the seven-hour drive down the 401 to once again set up shop in London, Ontario and resume training with his old squad at the Adrenaline Training Centre. “It was great training up there,” he said of his time in Montreal, “but it was more about my personal life. I have a daughter now and I just want to be closer to family. I have so much family and so many friends back here in London and I’m only an hour away from Chatham, so that was a big thing. “I’ve been here almost two years, full-time, and Andrew Elliott is my head coach. I’m working with all the same guys – Andrew Elliott, Leo Loucks, Mark Hominick, Chris Clements, Jesse Ronson, (Chris) Horodecki, (Sam) Stout; everybody. This is my home and I’m comfortable, happy and I perform really well when I’m happy. Last time around, Laprise logged an extended camp in preparation for his bout with Bofando and enjoyed tremendous success once the two hit the cage. After getting stung with a quick left early in the contest, the Canadian veteran turned to his grappling, forcing a clinch in the center of the Octagon and bringing the fight to the floor with a deft outside trip just prior to the two-minute mark of the opening round. A little more than two minutes later, the bout was over and Laprise was champing at the bit to get back to work as quickly as possible. “I had a super-long camp for that fight and then I took zero damage; I took one punch,” said Laprise, who returns to action Saturday night against fellow surging welterweight Vicente Luque in the main card opener. “So then I was right back in the gym on Monday, started training right away because I was hoping to fight earlier. And then the fight in Chile came up, so I’ve had a lot of notice for this fight; I think it was 12 or 13 weeks’ notice also. Much like the man he’s facing, Luque has enjoyed a great deal of success since arriving in the UFC, entering this weekend’s contest with wins in five of his last six outings, all of which have come by way of stoppage. Though he loves to compete in his home and native land of Canada, the chance to see another part of the world he might not otherwise experience was a big draw to Laprise. And while he knows Luque is a tough out, the 31-year-old Canadian is confident that he’ll push his winning streak to four on Saturday evening in Santiago, Chile. “It’ll definitely be fun,” he said of competing abroad. “It’ll be my first time there and so I’m flying in Sunday, which means I’ll definitely have some time before the fight to check the place out. We’ll do some sightseeing before it’s time to make weight and take care of business. “He’s a very tough guy and always comes to fight,” Laprise said of Luque. “He’s looking to have a war in every fight, so I’m definitely excited. He’s definitely a worthy opponent and I’m going to go out there and shut him down. I’m definitely going for the knockout – that would be four straight knockouts and he’s never been knocked out before, so four in a row would put me in a pretty good spot.